The main difference between good carbs and bad carbs is that the good carbs have a low glycemic index (GI), and they raise blood sugar levels more slowly whereas the bad carbs have a high glycemic index and they raise blood sugar levels rapidly. Furthermore, the rapid rise of blood sugar levels results in excessive production of insulin, which in turn increases the body fat. Therefore, bad carbs are more likely to cause obesity. Good carbs and bad carbs are two sources of carbohydrates which serve as a primary energy source of the body. Moreover, the carbohydrates that come from whole grain, vegetables, and fruit are good carbs while the carbohydrates that come from refined grains and added sugar are bad carbs. Good carbs are the carbohydrates which release glucose into the blood very slowly upon digestion. Therefore, they have a low glycemic index (GI); GI refers to the figure representing the relative ability of a carbohydrate food to increase the level of glucose in the blood. Here, values from 0 to 100 are assigned to food while the glycemic index of the pure glucose is 100. 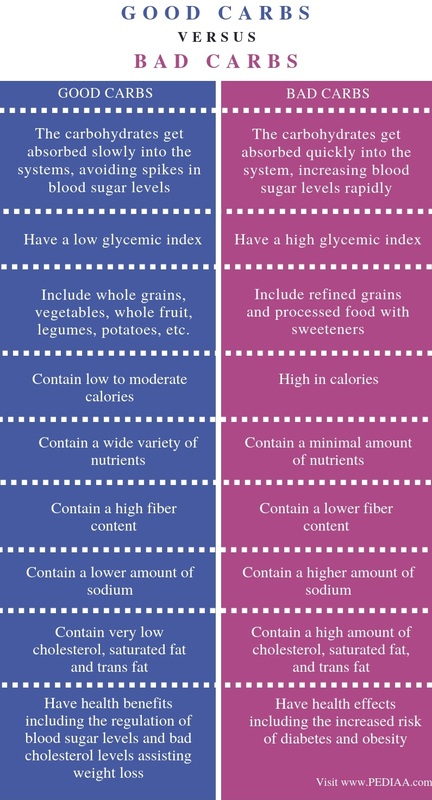 The glycemic index depends on the quality and the type of the carbohydrate. Thus, the cooking process, the presence of fat and fiber, etc. are the factors which determine the GI. 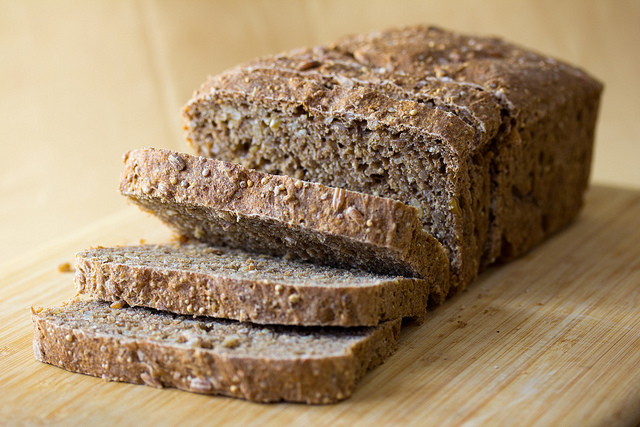 For example, whole grains have a low GI due to the presence of a higher amount of fiber. Moreover, ice cream also has a moderate GI since the presence of fat in ice cream allows the absorption of sugar. Generally, whole grain, fruits, and vegetables contain good carbs. Furthermore, good carbs can be divided into two categories based on the type of fiber present in it. Whole wheat bread, whole grain cereals, wheat bran, barley, brown rice, couscous, seeds, most vegetables, and some fruits contain insoluble fiber, which is not broken down during digestion. On the other hand, oatmeal, oat bran, nuts, dry beans, pea, seeds, most fruits, and avocados contain soluble fiber, which absorbs water. Moreover, good carbs come with a number of health benefits. They regulate the blood sugar levels as well as insulin levels, which in turn prevent obesity. Also, they reduce bad cholesterol, improve digestion, and assist in weight loss. Bad carbs are the carbohydrates which release glucose into the blood rapidly. Therefore, they have a high glycemic index. Unfortunately, the increased levels of blood sugar result in the excessive release of insulin. This insulin is responsible for the conversion of glucose in the bloodstream into triglycerides stored as fat. Therefore, high blood sugar levels ultimately result in obesity. Also, higher levels of blood sugar levels caused by bad carbs can result in type 2 diabetes. Therefore, carbohydrates with a high GI are considered as unhealthy when compared to carbohydrates with low GI. Generally, most refined carbs and processed carbs with sweeteners are bad carbs. Backed potatoes, corn flakes, jelly beans, waffles, white bread, raisins, etc. are examples of bad carbs with a high GI. Also, refined sugars including white sugar, corn syrup, and honey-added fruit juices are bad carbs. Good carbs and bad carbs are two categories of carbohydrates classified based on their glycemic index (GI). They serve as the primary source of energy in the body. Also, excess amounts of both can cause obesity. Good carbs refer to the carbohydrates that get absorbed slowly into the systems, avoiding spikes in blood sugar levels while bad carbs refer to the carbohydrates that get absorbed quickly into the system, increasing blood sugar levels rapidly. Thus, this is the main difference between good carbs and bad carbs. Furthermore, while good carbs have a low glycemic index, bad carbs have a high glycemic index. This is another major difference between good carbs and bad carbs. 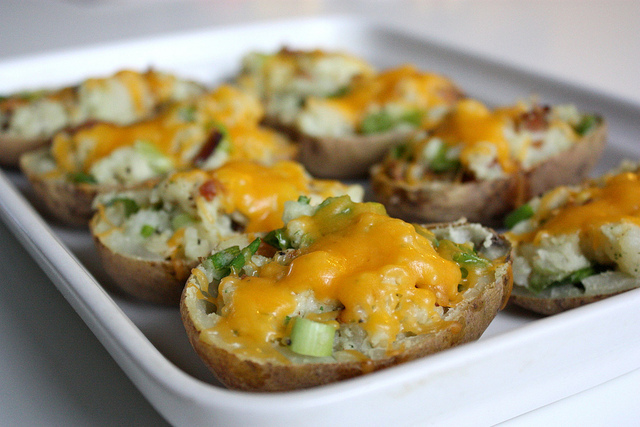 Good carbs include whole grains, vegetables, whole fruit, legumes, potatoes, etc. while bad carbs include refined grains and processed food with sweeteners. Another difference between good carbs and bad carbs is that the good carbs contain low to moderate calories while the bad carbs are high in calories. Moreover, good carbs contain a wide variety of nutrients while bad carbs contain a minimal amount of nutrients. Fiber content is also a major difference between good carbs and bad carbs. Good carbs contain a high fiber content while bad carbs contain a lower fiber content. Also, good carbs contain a lower amount of sodium while bad carbs are rich in sodium. One other difference between good carbs and bad carbs is that the good carbs contain very low cholesterol, saturated fat and trans fat while the bad carbs contain a high amount of cholesterol, saturated fat, and trans fat. Finally, good carbs have health benefits including the regulation of blood sugar levels and bad cholesterol levels, assisting weight loss, while bad carbs have adverse health effects including the increased risk of diabetes and obesity. Good carbs are the carbohydrates with a low glycemic index. Therefore, they release glucose into the blood slowly. Whole and unprocessed carbohydrate sources are good carbs. Also, good carbs have a number of health benefits. In comparison, bad carbs are the carbohydrates with a high glycemic index. Therefore, they release glucose to the blood rapidly. Generally, bad carbs contain other unhealthy components including cholesterol and fat. Bad carbs always associate with bad health effects including obesity, diabetes, etc. However, the main difference between good carbs and bad carbs is how fast the carbs raise blood sugar levels.